Canadian shoppers can now order Amazon’s newest Kindle, Kindle Paperwhite, and Kindle Paperwhite Wi-Fi + 3G, through the Canadian Amazon store, according to today’s announcement from Amazon. 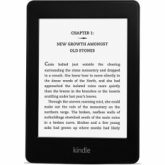 – The latest generation 6 inch basic Kindle costs CDN $89. – The Kindle Paperwhite with wi-fi is available for CDN $139. – The 3G wireless Kindle Paperwhite costs CDN $199. All of these are without special offers. According to Amazon, the Kindle, Kindle Paperwhite and Kindle Paperwhite with 3G support will support multiple languages including French. The homepage for the Kindle lineup available from Amazon.ca is here. Amazon also announced that Canadians will be able to access the Canadian Kindle store directly through their Kindles. The store includes best sellers from the Globe and Mail and Le Devoir best seller lists. The Canadian Kindle store has over 50,000 French-language titles and more than 1.5 million Kindle books overall, said the company. Will you be shopping Amazon.ca for a Kindle? Frustrated that it took Amazon so long to get the Kindle on their Canadian site? Let us know your thoughts in the comment section below!